Ever heard of Mamapalooza ? Well, if you haven’t you will soon. Founded in 2002, Mamapalooza set out to do nothing less than redefine the idea of motherhood, fueled by a traveling music event of rocker moms. The movement/music event has become the media darling now reaching an estimated audience of five million through communities, homes and networks. The phenomena was founded by Joy Rose, a true visionary driving nothing short of a mother’s/women’s movement from her house in the suburbs of New York City. Rose is a lower east side rocker chick turned mom turned movement leader, who now dressed in pink feathers, fishnet tights and leopard print mini skirts is helping women change perceptions of their identity as moms. Her journey and call for change began in 1994, when she crash landed in the suburbs of New York City married with four kids under five years of age, and confronting a life threatening illness. “ I was in the process of dying, and I knew that I needed to rediscover what was lost inside of me, and that was music. Being in the suburbs I felt totally out of the loop, but when I re-emerged within my life, and the community, what I found was people in all walks of life, with a dream deferred,” Rose explained. The process of Rose’s “coming back to life” brought the big questions of identity “front and center;” “Who am I, and what makes me happy?” In Joys case it was music. The story from this point forward is what happens after the “light goes on.” Joy reemerged as a musician with a new band (“Moms on Prozac”) and a radical vision of transforming the notion of motherhood from martyr and saint to an impassioned individual with a complete identity and sense of self purpose in tact. “If the world view of Moms changes to incorporate concepts of artistic, gorgeous, vivacious, intelligent sexual beings living out their passion collectively, then we’ve done a good job.” Joy states. 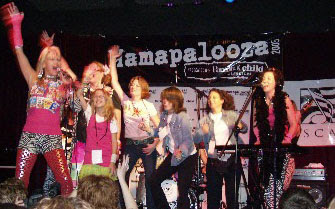 In 2002 Mamapalooza was born; one part music festival and entertainment brand, one part philosophy asking women to “live loud and become mothers of unlimited self esteem.” Today Mamapalooza is a multi platform brand operating an international music and arts festival, a creativity and lifestyles conference, a radio program, a music publishing arm with sights on building new programs and extending the message onto other media platforms. In addition Joy founded the Motherhood foundation the 501C3 arm that amongst other activities is setting sights on creating the first Museum of Motherhood in the world. The message of Mamapalooza is at the heart and center of every product the company produces; asking women to harness, cultivate and embrace their own passion and identity post-mommyhood, while simultaneously asking them to strip outdated notions of the self sacrificing mother stereotype. One look at at any one of the thousands of women performing and involved in the Mamapalooza events, and one can see the that Rose’s vision is ultimately answering a desperate call from modern moms seeking guidance on rediscovering their inspiration and sense of self. 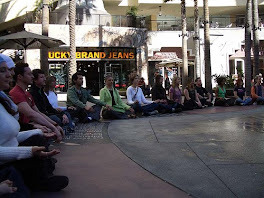 Mamapalooza Festival runs through month of May annually, worldwide. Tonight, November 15, 2007, you can catch Joy performing with her band "Housewives on Prozac" at the Cutting Room in New York City (19 West 24th Street) at 7:45 PM in a benefit concert for the Motherhood Foundation and the PHASE petition to shut down Indian Point.